At China Live in San Francisco, chef George Chen serves up modern Chinese cuisine. SAN FRANCISCO — In an expansive dining room ringed by four kitchens, a chef slices a crisp, roasted pork belly in front of a giant stone oven across from a pastry chef preparing a rice flour crepe with milk tea shaved ice. At the other end of the room, two experts pinch soup dumplings and vegetarian pot stickers. The dining room isn’t in Shanghai or one of Asia’s glossy indoor food courts. It’s part of San Francisco restaurateur George Chen’s dream venture: a four-story dining and retail emporium that he hopes will help Americans regard Chinese cuisine with the prestige of European styles. People like to be immersed in a real place, where the food is being produced. You sit at the kitchen counter and see them making dumplings like you’re on the streets of Shanghai. “I always wanted to do this kind of restaurant, it was just a matter of where I was going to put it,” Chen — known for his restaurants Betelnut and Shanghai 1930, which both opened in the '90s and closed in the '10s — said of China Live. The 30,000-square-foot building was the kind of cavernous space that could hold Chen’s vision for China Live, a place to showcase the traditional attention to quality and the variety of cuisines in modern China. Enough people believed in Chen’s vision that he was able to raise more than $20 million in capital to renovate the building, he said, outfitting it with top-of-the line kitchens and décor. In March 2017, the first floor opened with a food hall-style restaurant, a café featuring Chinese teas, a bar, and a store selling high-end cookware like ceramic coated-woks, teas sourced by Chen himself, and the same artisanal oils and sauces served at China Live. But don’t call China Live a food court. As executive chef, Chen oversees the kitchens and — with the exception of the cafe — the orders are taken and delivered by waitstaff. The menu changes daily and includes familiar dishes such as minced chicken lettuce cups, along with less familiar regional fare such as sheng jian bao, pan-fried buns filled with pork meat and soup, which Chen said is now the restaurant’s top seller. Other favorites are made with a twist, such as dry-cooked green beans with the addition of salted Yunnan olives. Even classic Peking duck gets changed: Instead of being served with the usual steamed bun, slices of duck are sandwiched in a crispy oven-baked sesame bread similar to flaky shao bing. Prices are a little steeper than a typical Chinatown restaurant, with an appetizer such as pickled cucumbers at $8 and a whole crackling-skin Cantonese chicken ringing in at $30. Some on social media have criticized the prices, noting that they were out of reach for many Chinatown residents. Chen attributes the higher tab to better quality ingredients, such as organic produce from a family farm in Sonoma County. All of this is served in the kind of environment diners have come to expect from Chen. Counters are fashioned from marble and elm from China. Blue and white tiles painted with iconic images of the San Francisco Bay cover a wall. Restaurant industry analyst Bonnie Riggs of NPD Group said there may be something to Chen's idea. She studies the dining habits of different generational groups, including millennials, who NPD has found tends to shun casual-dining restaurants. Riggs believes that a venue like China Live could capture those young diners by offering an experience, rather than just a place to eat. Last fall, the second floor opened featuring a Scotch whisky-centric lounge, private event space, and the Eight Tables restaurant. The intimate dining room features only eight tables, serving prix fixe dinners which run $225, with an additional $125 wine pairing. Offerings could include Iberico char siu pork or dumplings with caviar, sea urchin, bay scallop, and trout roe. The third floor is available for large parties such as weddings and corporate events. Its first fete was a 98th birthday party for legendary San Francisco chef Cecilia Chiang, who ran the Mandarin restaurant for 30 years and has been credited with introducing authentic Shanghainese, Sichuan, and northern Chinese food to America. I always wanted to do this kind of restaurant, it was just a matter of where I was going to put it. Many have compared China Live to a Chinese version of Eataly — the Italian food emporium started by Mario Batali and Lidia Bastianich — which now has multiple New York locations, as well as outposts in Chicago, Boston and Los Angeles. 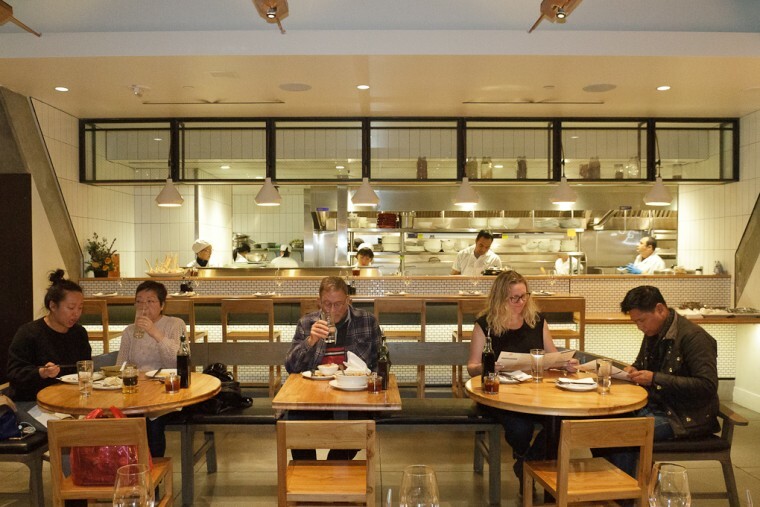 These large-scale restaurants are risky, as reflected by the closure of Eataly Chicago’s fine dining room Baffo, Riggs noted. “People that are looking to open unique or new concept restaurants will watch this concept before they venture out into that space,” she said. Meanwhile, Chen isn’t fazed by the risk that comes with such a big venture. He is now working on turning the fourth floor and rooftop — with its 360-degree views of San Francisco — into another lounge, slated to open in fall 2018.